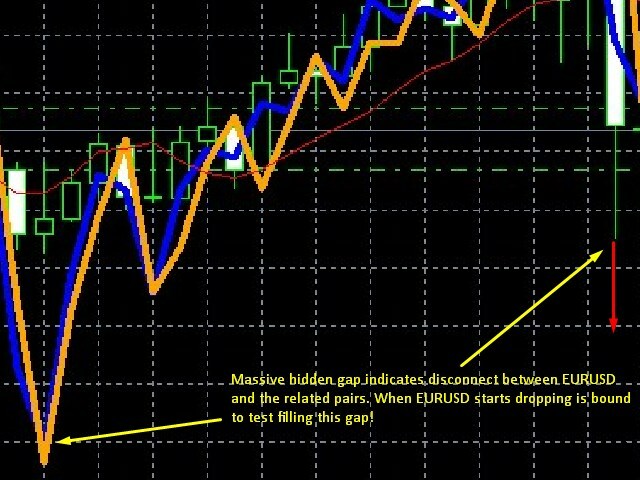 This Indicator relies on intermarket analysis, using EURCHF, EURAUD, AUDUSD and the USDCHF pairs, to generate signals on EURUSD only! 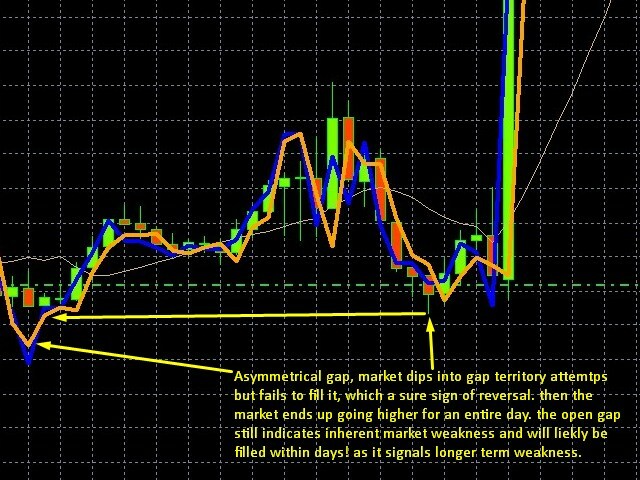 In order for the indicator to work, all these pairs must be available on the MT4 platform. The fundamental idea relies on EURCHF and how money flows in and out of safe haven markets and in and out of risk markets. EURO being a risk market and Swiss Franc being a safe haven market... As the idea evolved, the indicator improved by adding the other pairs. This indicator takes some time to learn, but it does work well in providing exit signals and warnings. It is hard to use because markets are hard to trade, it couldn't be otherwise. 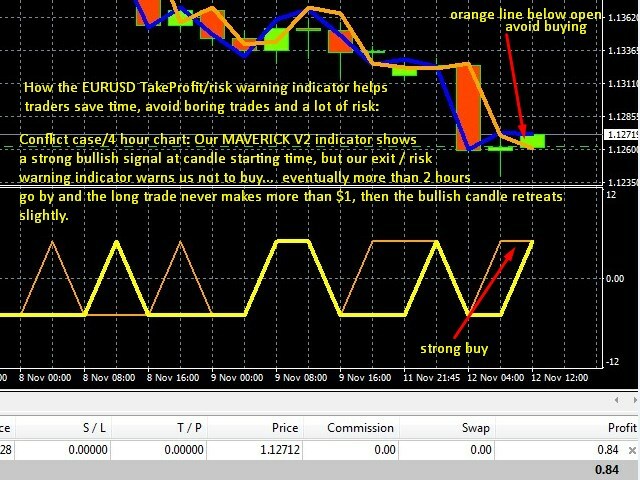 And it is a specialized indicator, specifically developed for EURUSD, as I only develop and test specialized algorithms. I have been studying the markets for 18 years, and have found that generic strategies don't work! 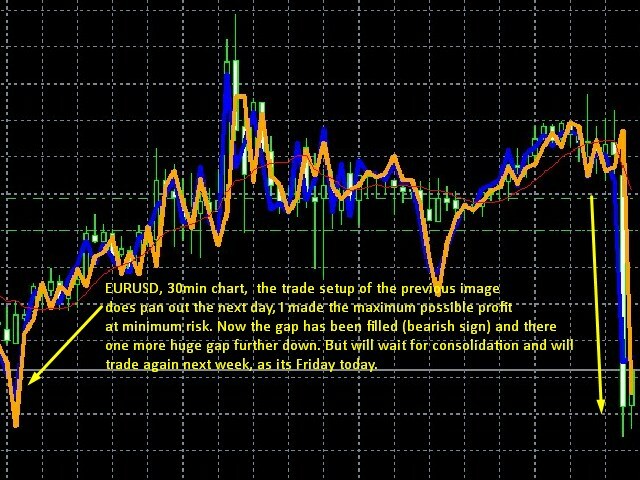 This indicator is currently being used in an experimetal highly complicated EA that I am developing, where the objective was for this indicator to cut through the volatility of EURUSD. So that the trade in question is exited at better profit, before price reverses off the high/low, and to also avoid entering trades when the indicator warns so. Eventually after about one year of trial and error, a proper exit indicator was made. 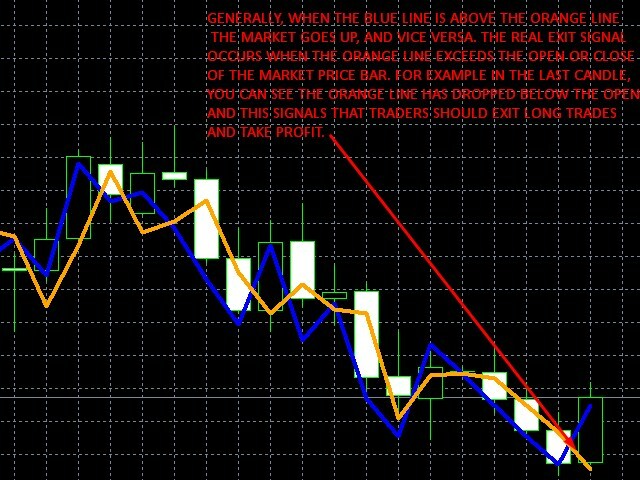 1)The indicator consists of a blue and orange line, these lines express intermarket supply/demand forces of the other pairs relative to EURUSD. 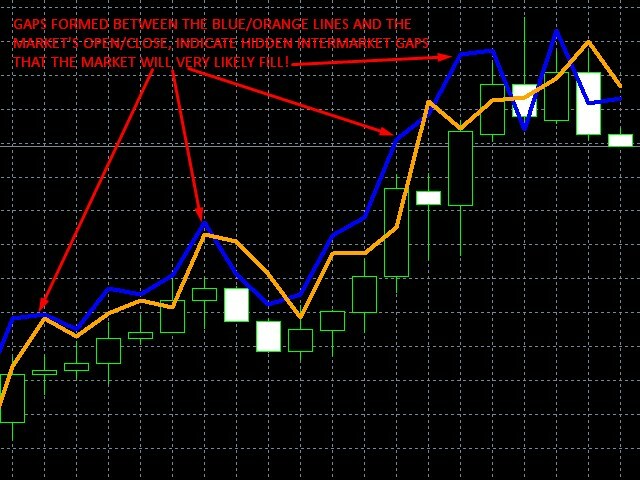 Generally, when the blue line is above the orange line EURUSD goes up, and when the blue line is below the orange line EURUSD goes down. But this is not very useful since the blue-orange lines can overshoot each other. 2)The real task of the indicator is to tell us when to get out of the trade, or whether not to trade at all. So this is indicated by the orange line! If the market has been going up and the orange line drops below the open, it's time to get out of long trades. 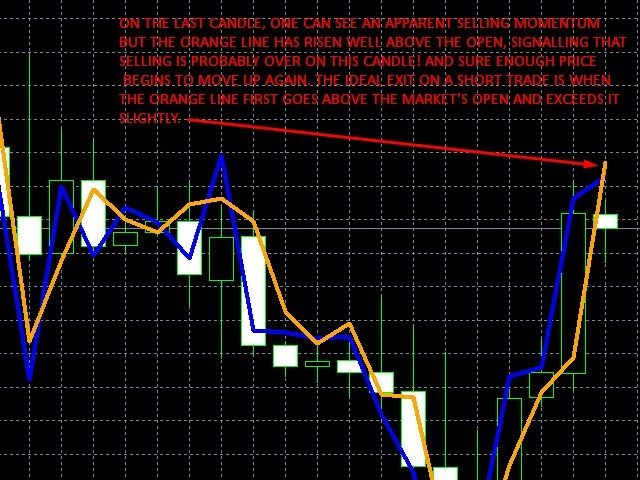 If the market has been going down and the orange line rises above the open it's time to get out of short trades! 3)When the blue and orange lines seem to momentarily exactly match the high/low (or low/high) of the latest candle, this is a sign that the high/low has been made! 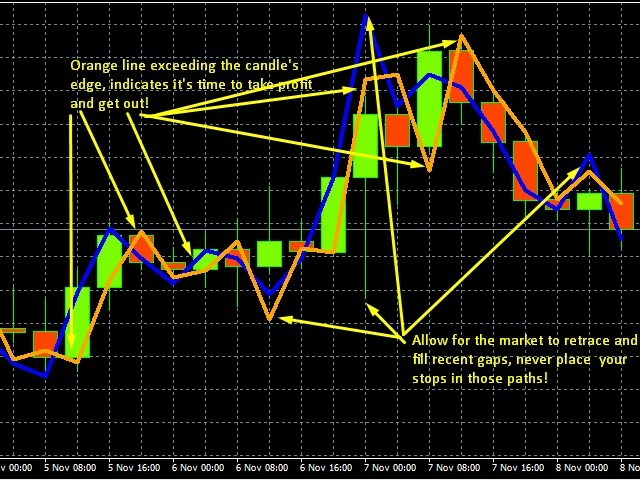 4)If a new candle begins, and the orange line is way above the open, all short trades should be avoided! Likewise, if the orange line is way below the open, all long trades should be avoided! 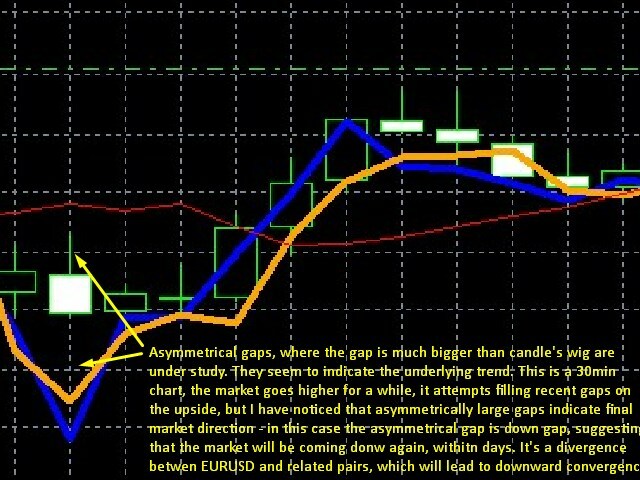 5)It was found that the indicator also reveals hidden gaps between EURUSD and the related pairs. These gaps are formed by either or both lines, and indicate levels of supply/demand, that EURUSD will likely fill these gaps and stall at those levels. 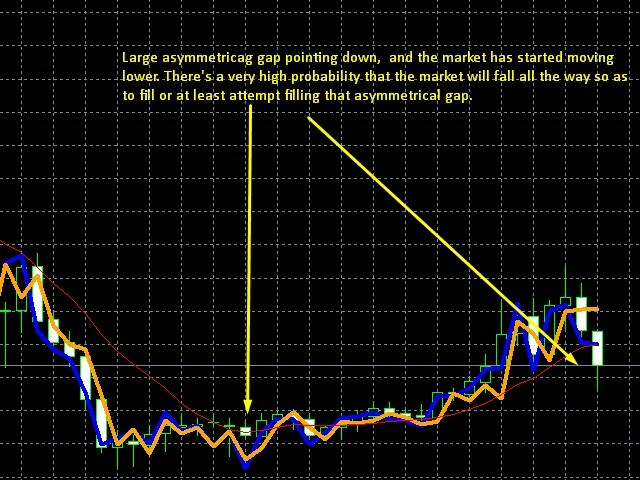 It's not a directional indicator, but it works just like gaps in classic charting theory. 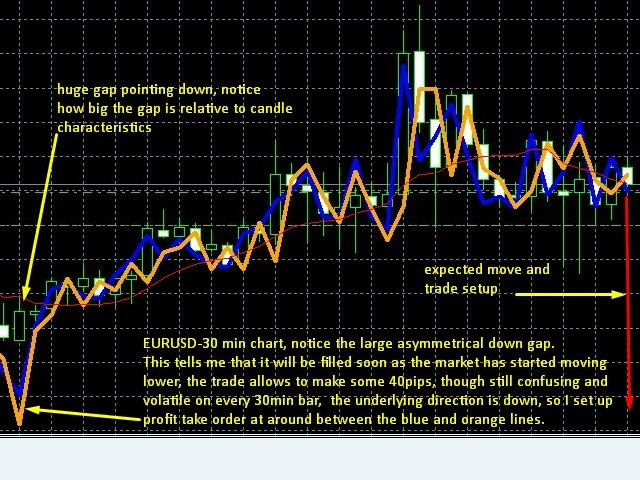 All in all this indicator has worked well in manual trading, making a big difference between winning and losing in all strategies, because it helps avoid many losing trades and take profits at better levels. I personally trade between the 30min and 4 hour time frame. 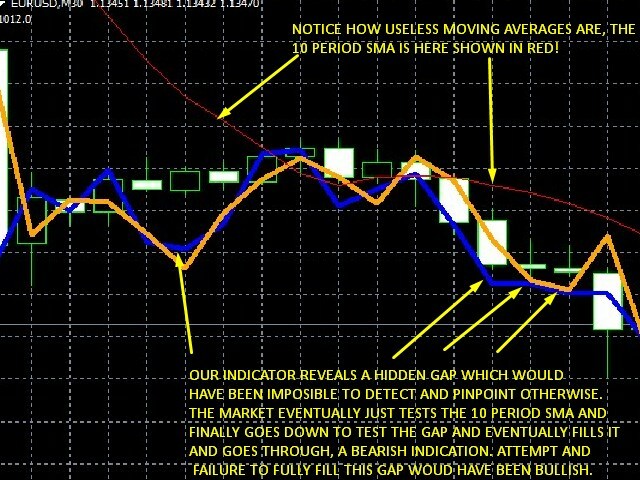 While gaps on charts are more complicated, but it seems when the market moves towards gaps, it usually does fill them, this happens from the 30min chart through to weekly charts. The number of candles the indicator runs through is set to 150 by default, but the user can change it to any number by changing the external variable C in the settings! Finally, the indicator also prints the number of seconds left for the latest candle, so that the user can look to enter trades more in the first half of the candle, this helps even more. Personally, I enter trades during the first half of a candle's duration, and I exit the trade at any time, even in the last few seconds if necessary, I only exit the trade when the orange line tells me so. Best indicator on the market! This version is for TradersWay ECN clients where market symbols have an 'i' suffix.